SOLD. 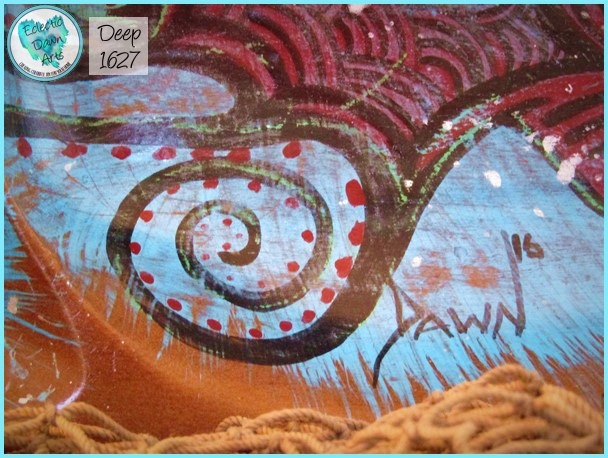 #1751 SIZE: ~3.5" square. 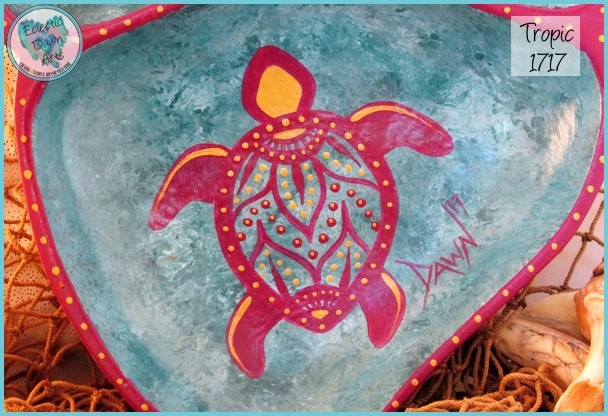 A sweet double-heart ribbon turtle in black and turquoise swims through bubbles on a background of blue. 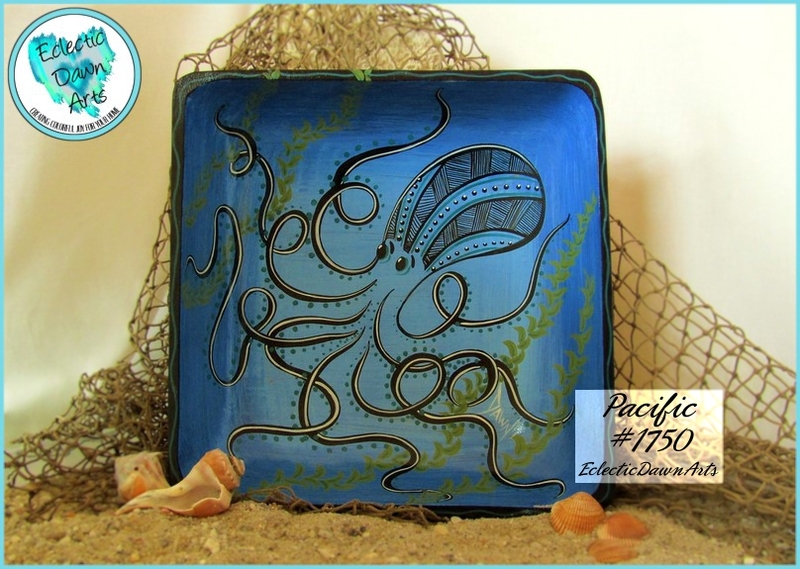 #1750 "Pacific" SIZE: ~10" square (sizes approx., accessories not included) Free shipping. 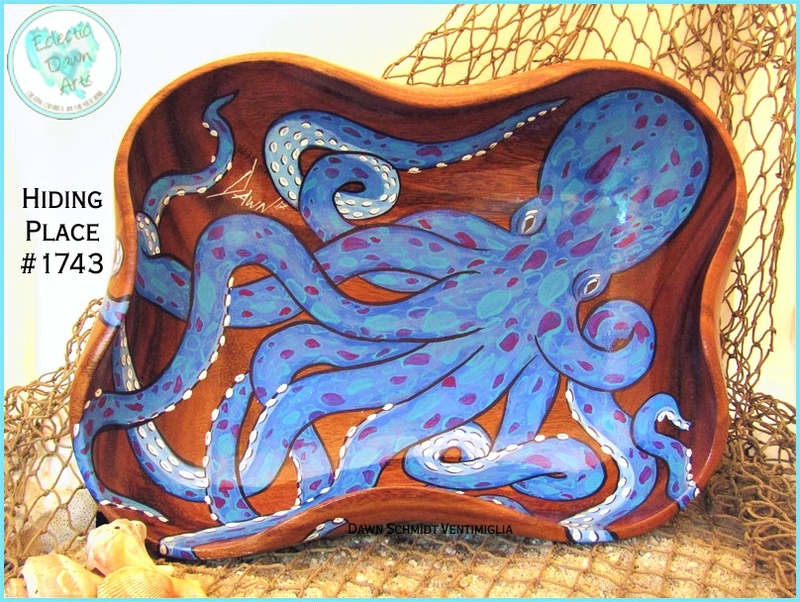 An elegant octopus stretches his long tentacles across this wooden bowl of blue, reaching into the depths across the kelp garden. This piece has a captivating flow and energy! 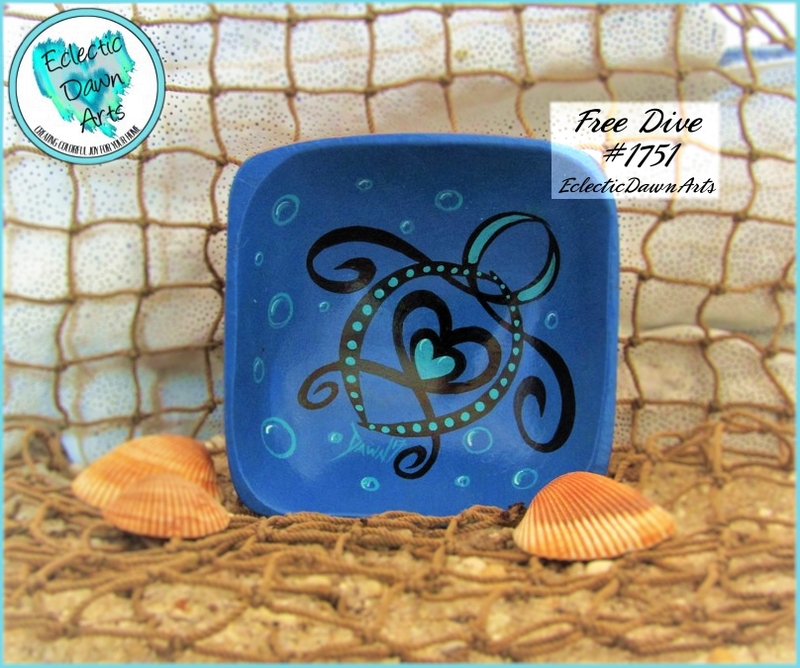 #1748, Sea Dream, SIZE: ~6" square (sizes approx., accessories not included) FREE SHIPPING. 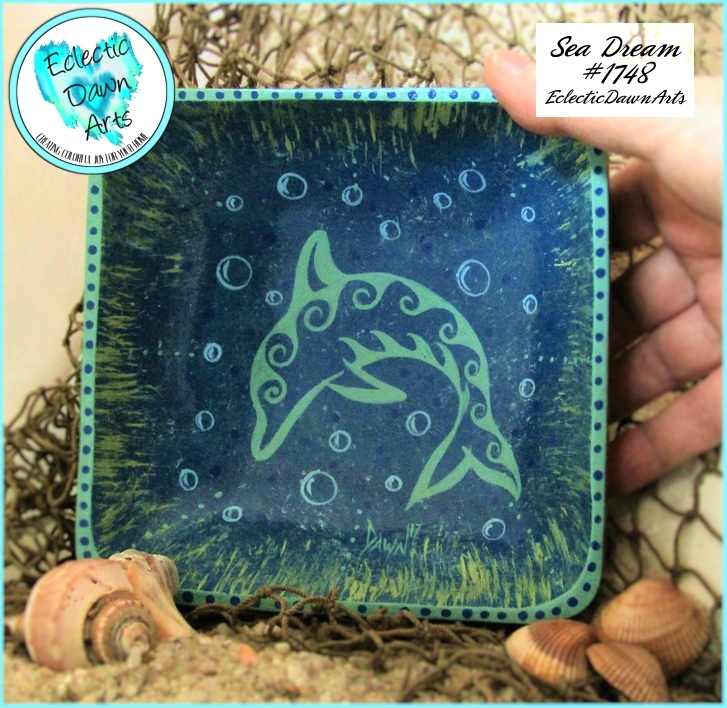 A single tribal dolphin in soft mint/celadon green leaps against a blue background while surrounded by bubbles. Soft and strong at the same time, this piece says so much about the softer side of strength. 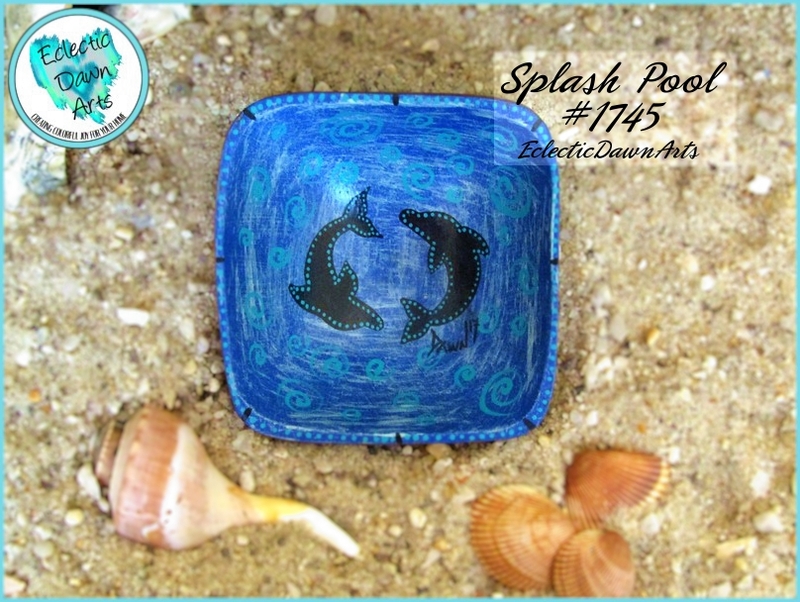 #1747, The Bounty, SIZE: ~6" square (sizes approx., accessories not included) FREE SHIPPING! 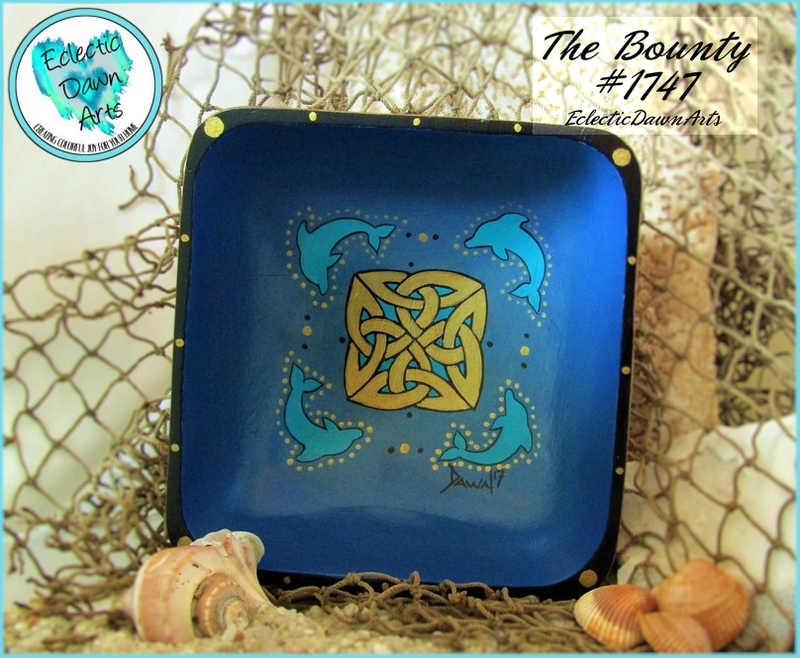 Four aqua dolphins surround a metallic gold celtic knot on a blue background. Metallic gold dots embellish the black edge. Due to screen variations, colors may not appear true to hue, and everyone's perception of color is unique. #1745 SIZE: ~3.5 square (sizes are approx.) Accessories not included. Two dotted dolphins swim on a blue background surrounded by subtle aqua curlique swirls. Aqua dots adorn the edge. FREE SHIPPING. 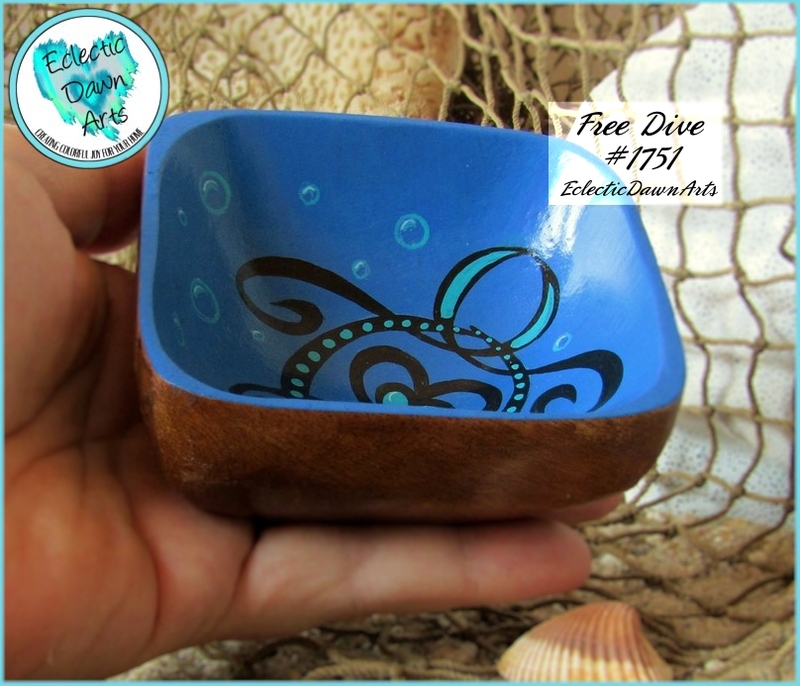 #1732 : "Jelly Blues" trinket tray/decorative bowl in blue, white, purple. (accessories not included). 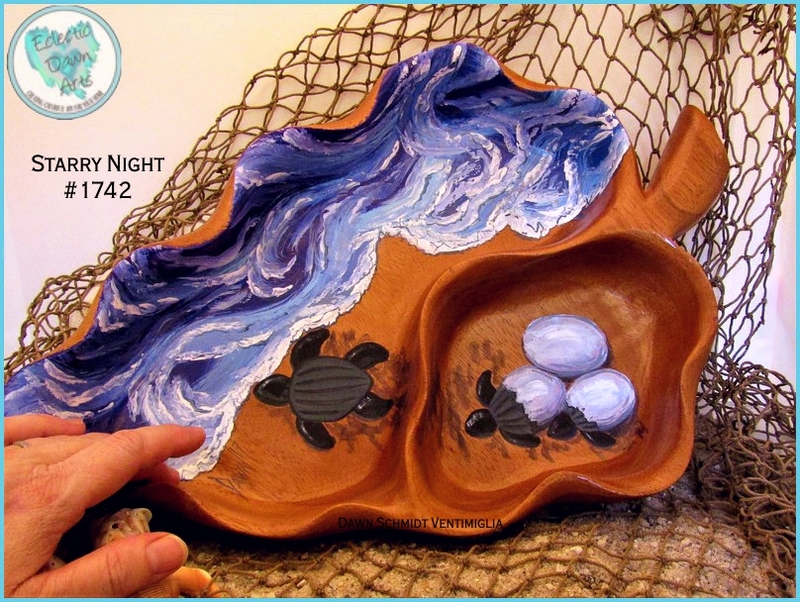 ~6.5 x 6" clam shell shape (sizes are approximate due to the organic shapes). Beach lover? 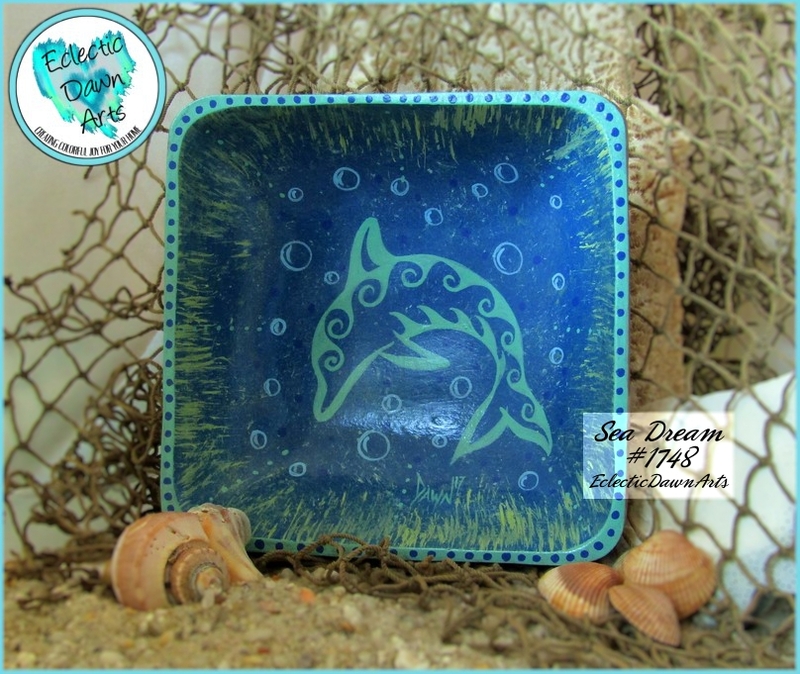 Dreaming of the ocean? 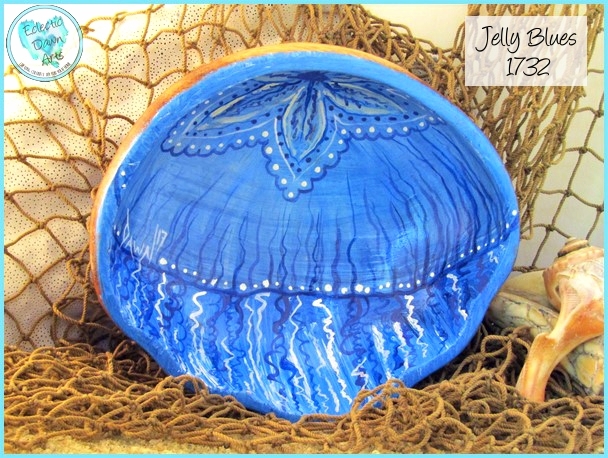 Place this pretty jellyfish bowl anywhere to remind you of the fragile beauty of the sea. This art piece is a conversation starter that can also be used to stow small trinkets or earrings, and it makes a truly one-of-a-kind gift (if you don't decide to keep it for yourself). 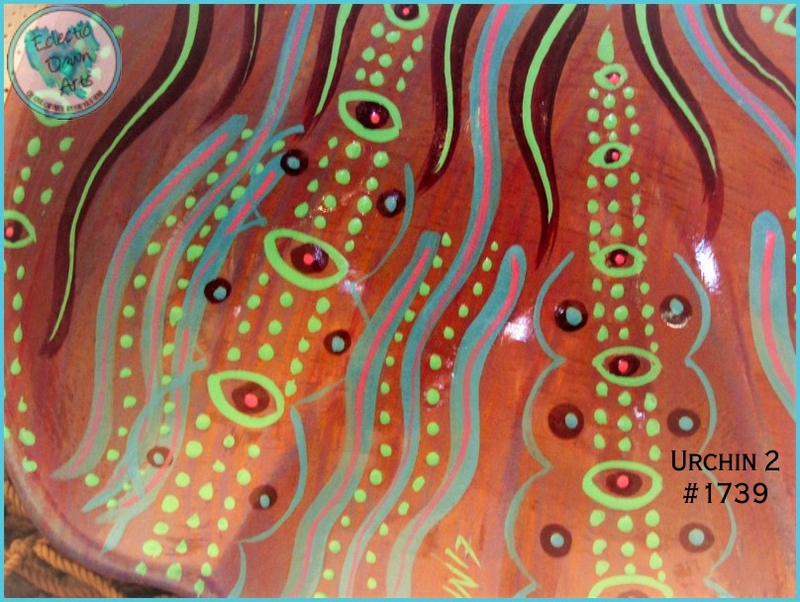 Original jellyfish art ©Dawn Schmidt Ventimiglia. 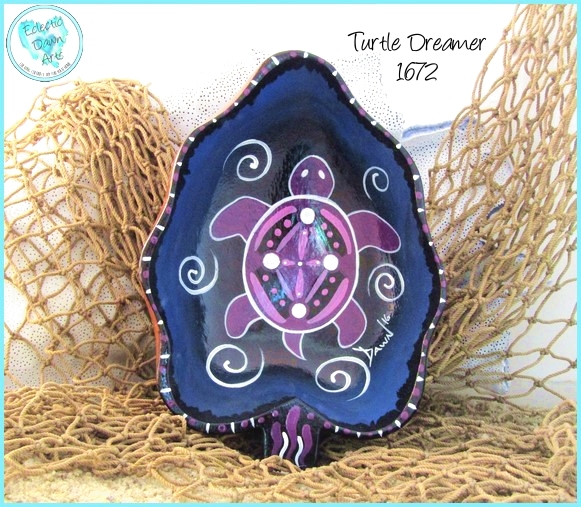 #1672 : "Turtle Dreamer" (accessories not included), ~6.75" x 4.75" (sizes are approximate due to organic shapes), Original art by ©Dawn Schmidt Ventimiglia, this one-of-a-kind aboriginal style turtle painted inside this bowl in updated colors of blues and purples will be a conversation starter on any table and makes a beautiful gift for a turtle collector or turtle lover, too! Use this bowl in your own home to watch over your keys or jewelry at the end of the day. 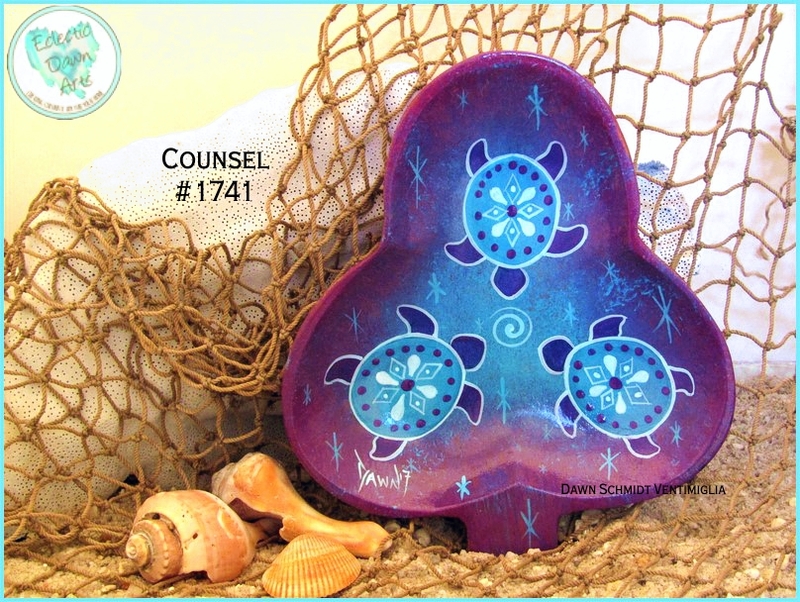 #1717 : "Tropic" Turtles Trinket Tray/Decorative Bowl. ~13.5" x 7.75" (sizes are approximate). Three fancy turtles swim against a teal and aqua background. 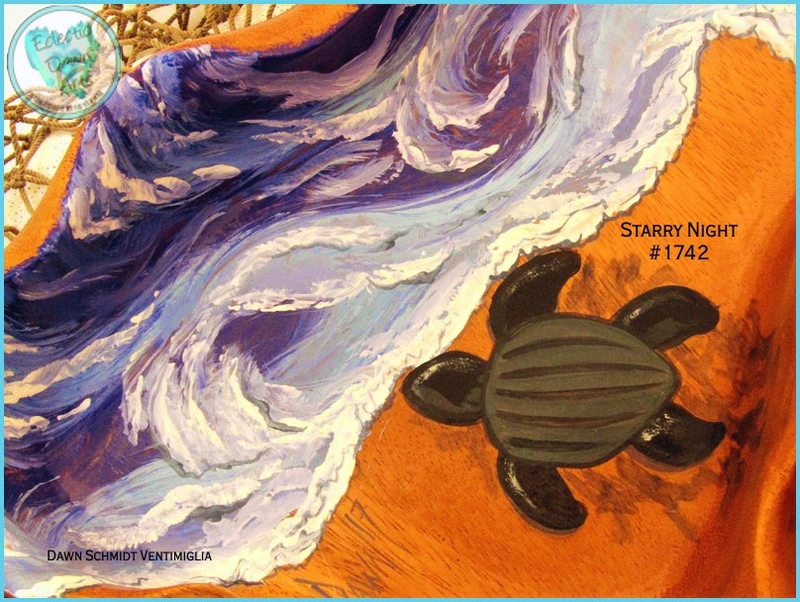 The sea turtles are painted in luscious berry wine and metallic gold. 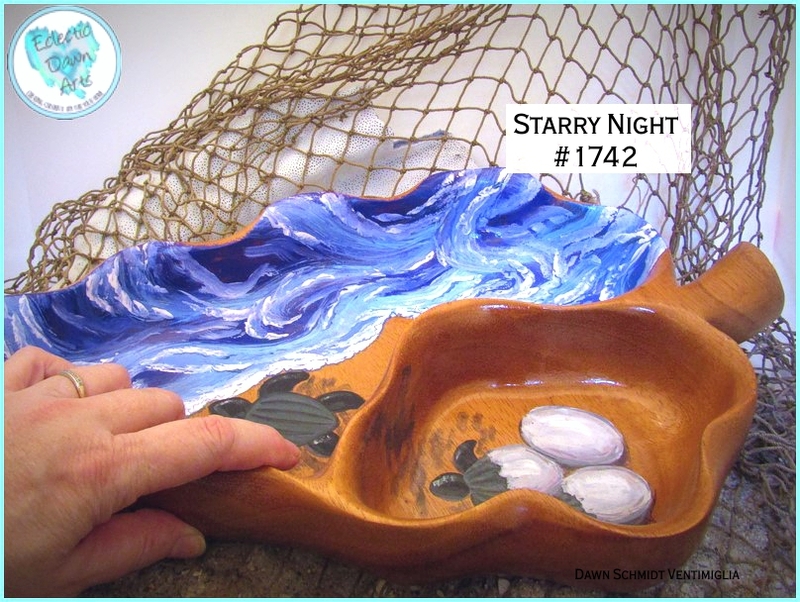 Use "as is" or the tray can also be used as a place to set your jewelry at the end of the day. Accessories not included. #1627: "Deep" (accessories not included, shown for size),~11.5" x 6.75" divided bowl (size approximate due to organic shape). Original art ©Dawn Schmidt Ventimiglia. 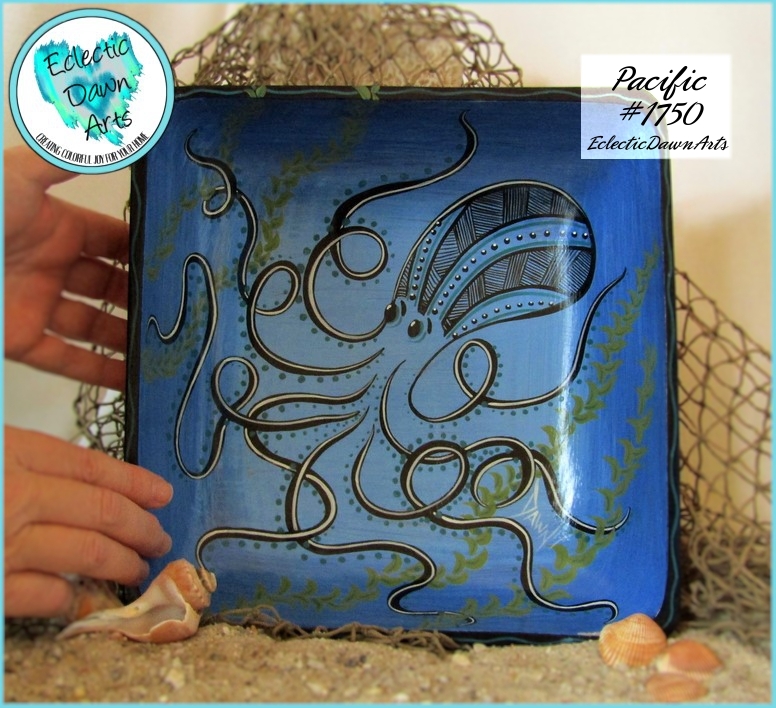 Slightly distressed, this octopus looks like a Polynesian or South Seas artifact. 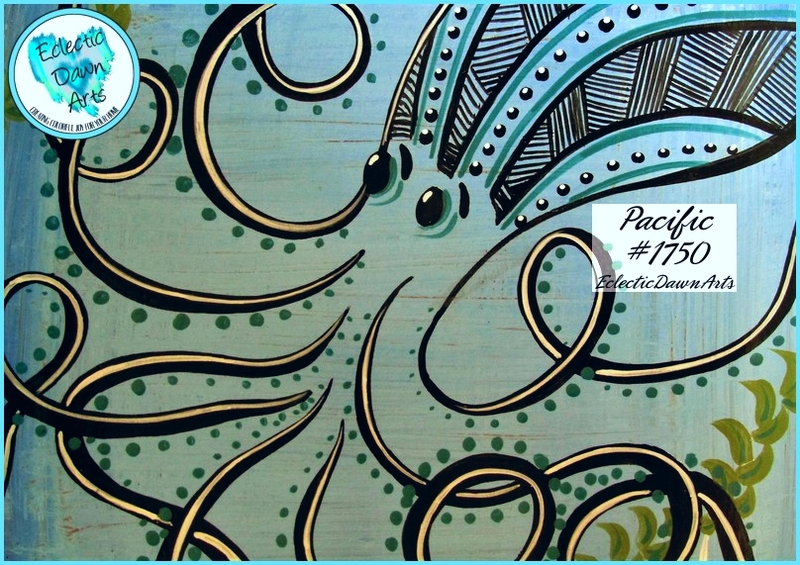 The background is turquoise/aqua, setting off a stylized octopus with tribal body art and dotted tentacles. Each tentacle of an octopus has enough neurons to "think" on its own! Two of the "arms" actually act as "legs", allowing the octopus to walk on the ocean floor or push off of surfaces, much like we would jump. #1618 : "Sphyr" Shallow Bowl or Tray (accessories not included, shown for size), ~19" x 8" (approximate due to the organic shape). Miss the ocean? 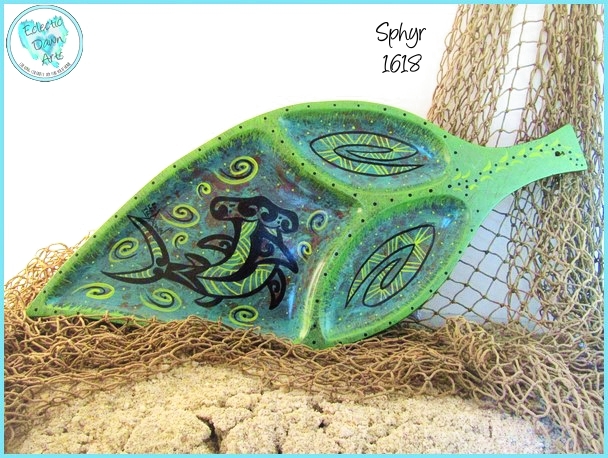 The cool colors, blue and green background, and the hammerhead design bring the waves to your coffee table or wall. "Sphyr" is short for Family name "Sphyrnidae", which includes most of the sharks with unusual-shaped heads, such as hammerhead, bonnethead, or scoophead sharks. 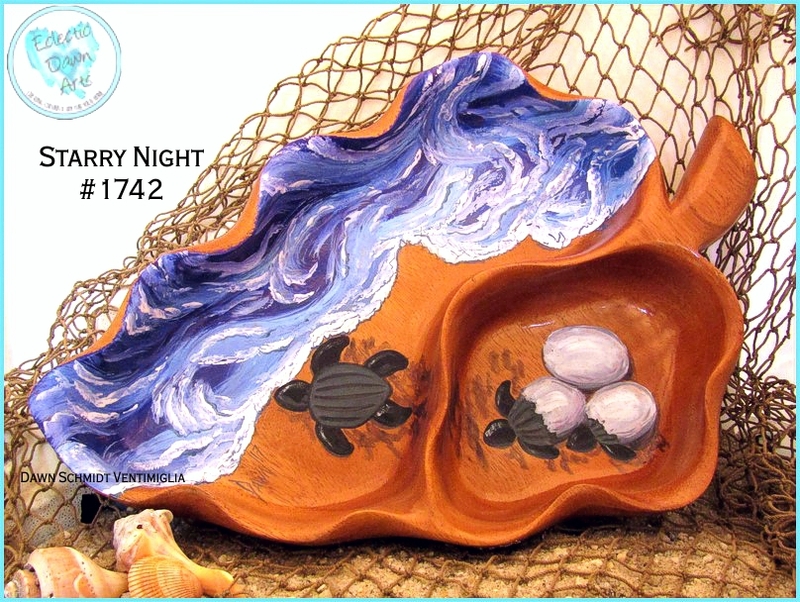 This is a one-of-a-kind conversation piece for any ocean lover, a special gift for a diver, or a nice addition to your tiki bar! Mahalo! 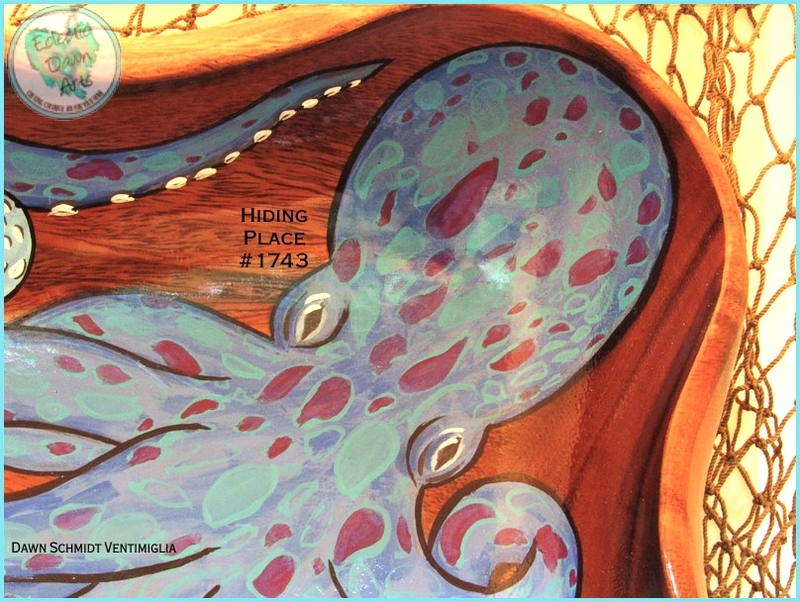 #TB1743, Hiding Place, 12.5 x 9 inches 14.75inches along the long diagonal (sizes are approx.) 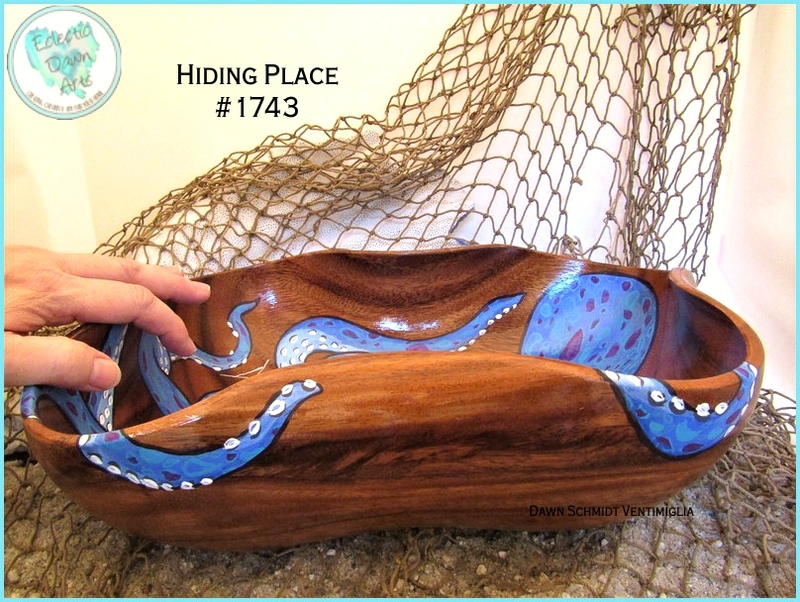 This clever spotted octopus is in the midst of changing the color of his spots...and he's found a perfect hiding place inside this unusual bowl. 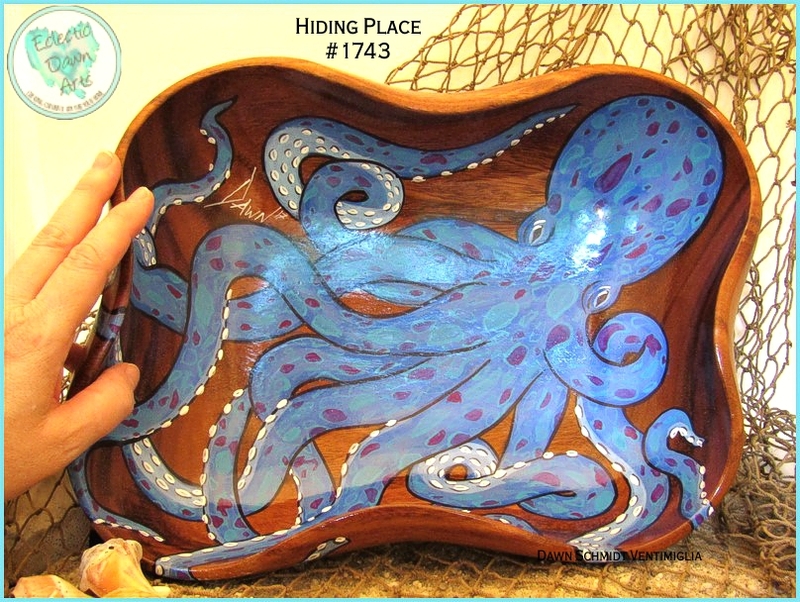 Some of the tentacle painting is done on the outer edge of the bowl for added effect (see all photos). 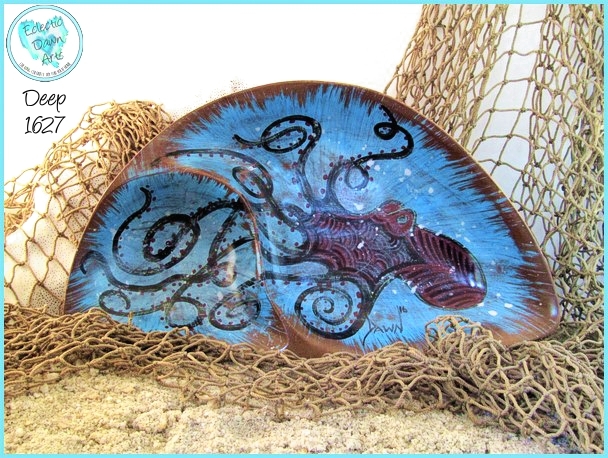 Vibrant blue and berry with a light teal make up the colors of this sea creature who is waiting to make his home in YOUR home! This is a STATEMENT piece: large, unusual, and unique. Free shipping. Not food safe, clean with damp cloth, do not put in dishwasher. 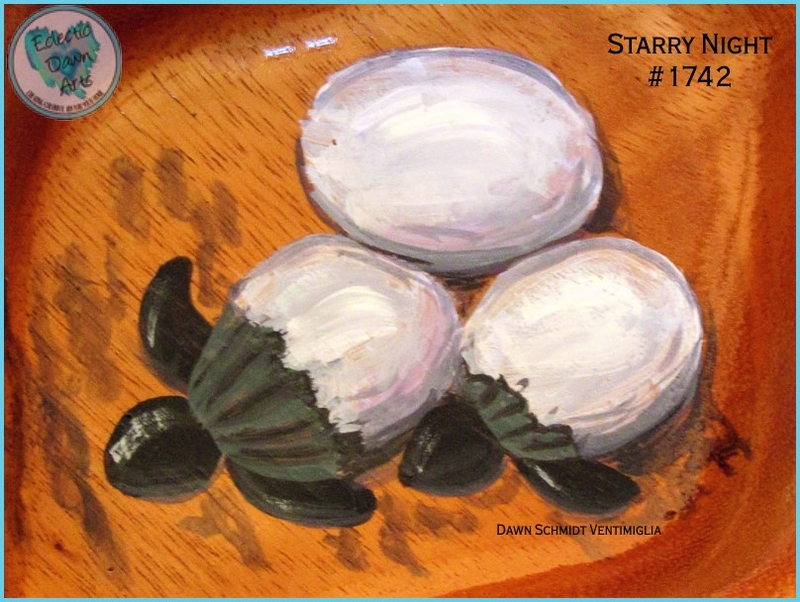 #TB1742, Starry Night, 15.25 x 10 inches (sizes are approx.) A trio of leatherback turtles is in the process of hatching, while one hatchling has almost made it to the swirling waters on the shore. 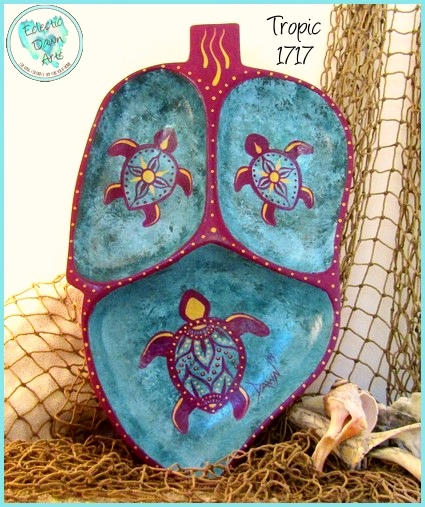 This is a large statement piece that is a conversation starter for every turtle lover, ocean lover, and beach baby! Free shipping. Not food safe, clean with damp cloth, do not put in dishwasher. 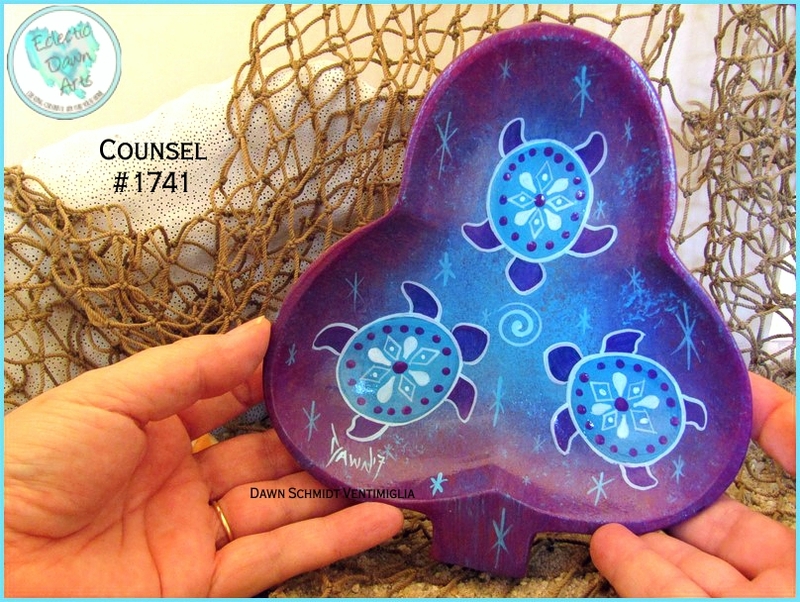 #TB1741, Counsel, 6 x 7 inches (size is approximate) A rich purple and blue background of stars set off this turtle trio who have gathered to counsel each other. A beautiful piece to share with a friend who needs support.Free shipping. Not food safe, clean with damp cloth, do not put in dishwasher. 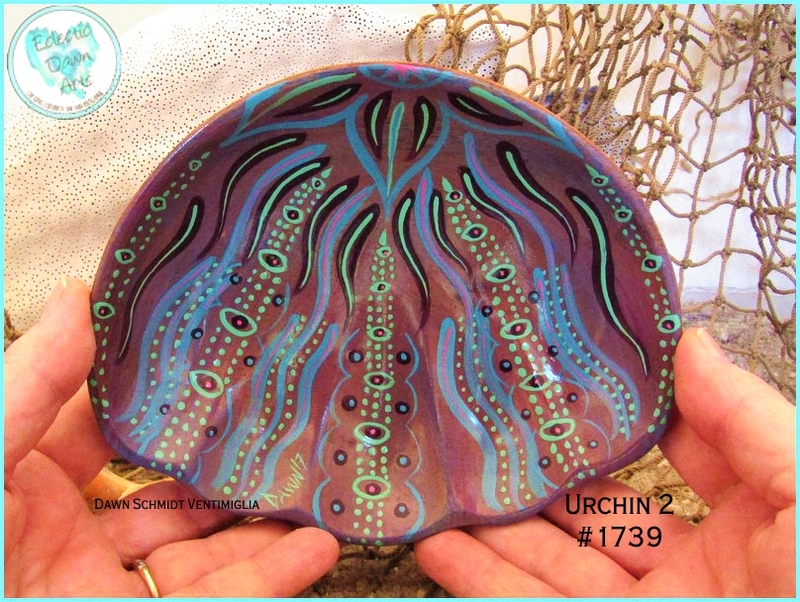 #TB1739, Urchin 2 sealife bowl, ~6 x 5 inch clamshell shape (sizes are approx. 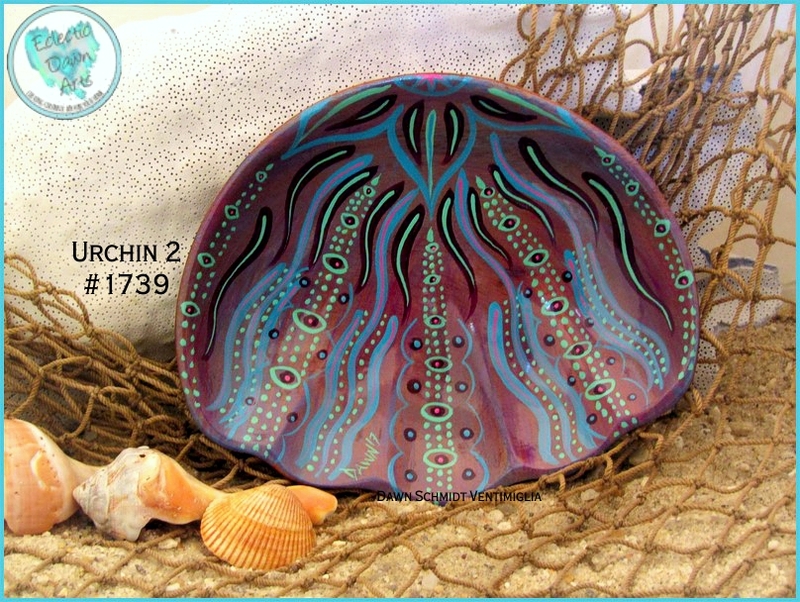 due to organic shapes) An abstract freeform boho sea urchin design in purple, mint, pink.Free shipping. Not food safe, clean with damp cloth, do not put in dishwasher. 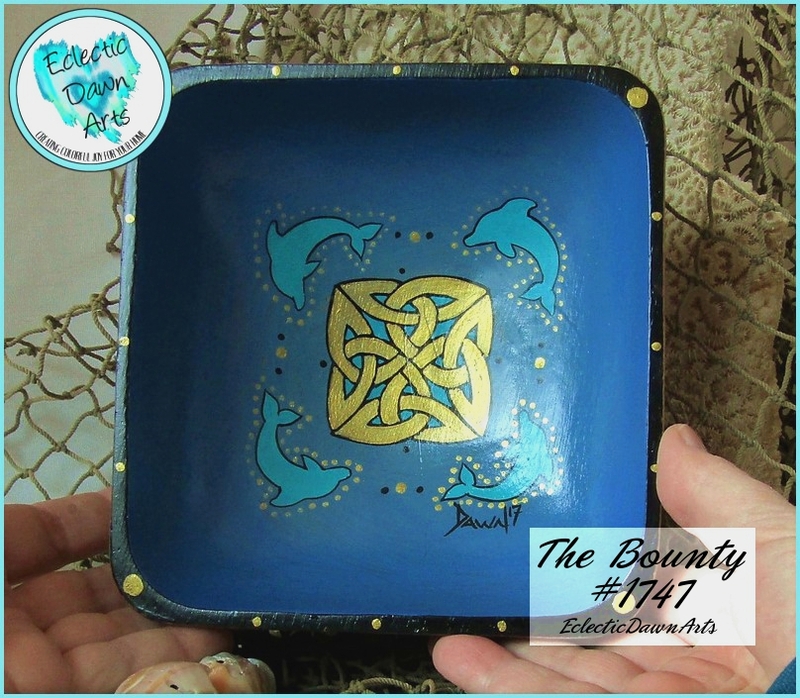 #TB1727 : 'Fan Dance' decorative bowl in teal, blue, lime, metallic silver, burgundy (accessories not included). ~5 x 5.25 inch (sizes are approximate). 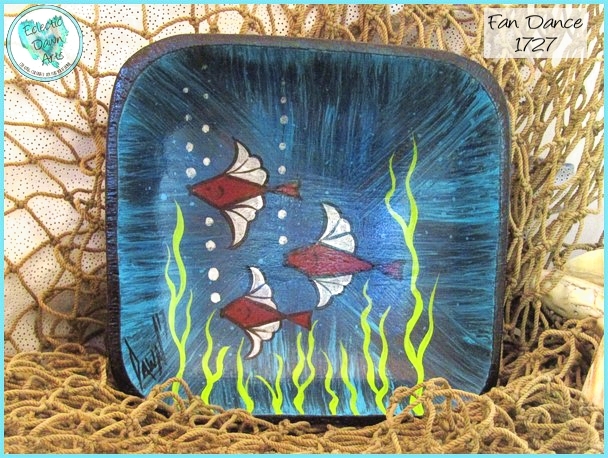 Three fancy stylized fish swim above a field of seaweed, with fins looking like fans in this handpainted bowl. This unusual piece will be a conversation starter, no matter where you set it! A great place to keep your rings or earrings at the end of the day. Perhaps you know an aquarium lover or protector of sealife who would enjoy the whimsical fish (and they never need feeding)! Free shipping. Not food safe, clean with damp cloth, do not put in dishwasher. 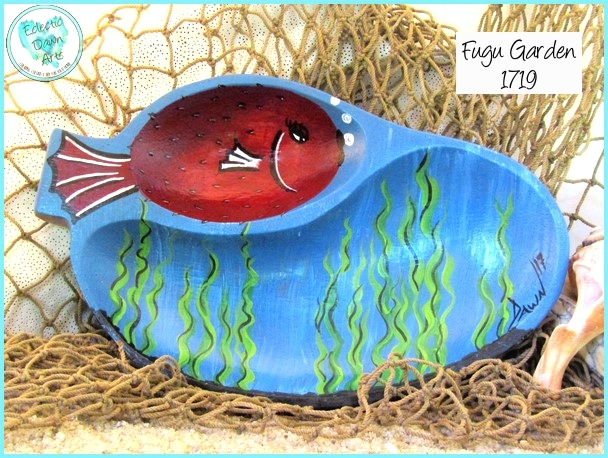 #TB1719 : 'Fugu Garden' Trinket Tray or Decorative Bowl, accessories not included. ~8.5 x 5 inch two section leaf shape (sizes are approximate due to the organic shapes). A cute little pufferfish (fugu) blows tiny bubbles while surveying her garden of kelp. The pufferfish is painted in the smaller indentation of the bowl, and her garden is painted in the larger indentation. This piece is a perfect size to put on an end table for a smile, or on a nightstand to hold your earrings, rings, or watch at the end of the day. Free shipping. Not food safe, clean with damp cloth, do not put in dishwasher. 'Fireheart' Ring Dish, Earring Tray, Trinket Tray TB1676 (accessories not included), ~8.5 x 5 inch (sizes are approximate). 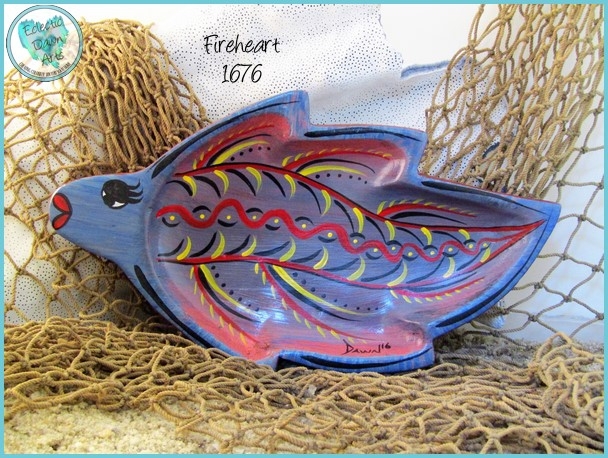 Let this fish bowl (or tray) bring some fire energy to your home! 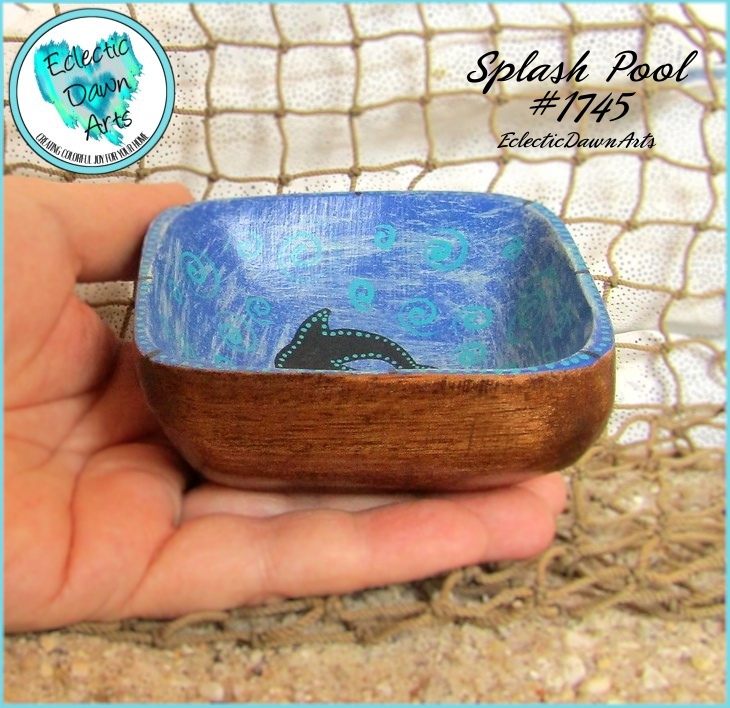 A perfect gift for a person who likes betta fish (Siamese Fighting Fish), it can be used to gather tiny items, or just as a splash of color on an end table. Free shipping. Not food safe, clean with damp cloth, do not put in dishwasher. 'Flower Girl' trinket tray/earring dish, TB1675 (accessories not included). ~8.5 x 4 inch (sizes are approximate due to the organic shapes). 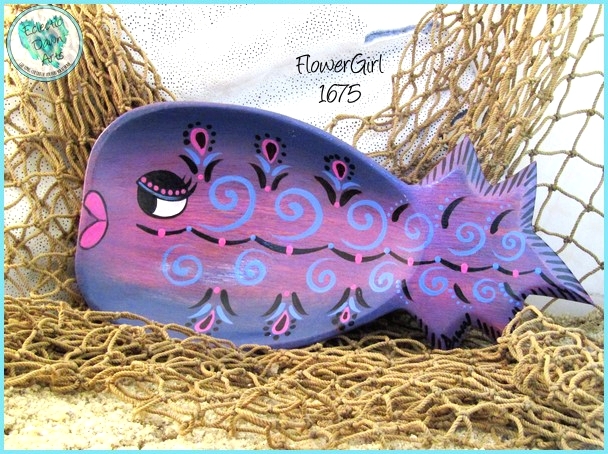 This whimsical fish bowl (or tray) will swim right into your heart with her pink lips, swirls and stylized blooming flower pattern. Various shades of purple in the background with blue, pink, black designs. Great as a smile-maker, but can be a useful place for tiny items like earrings, too! 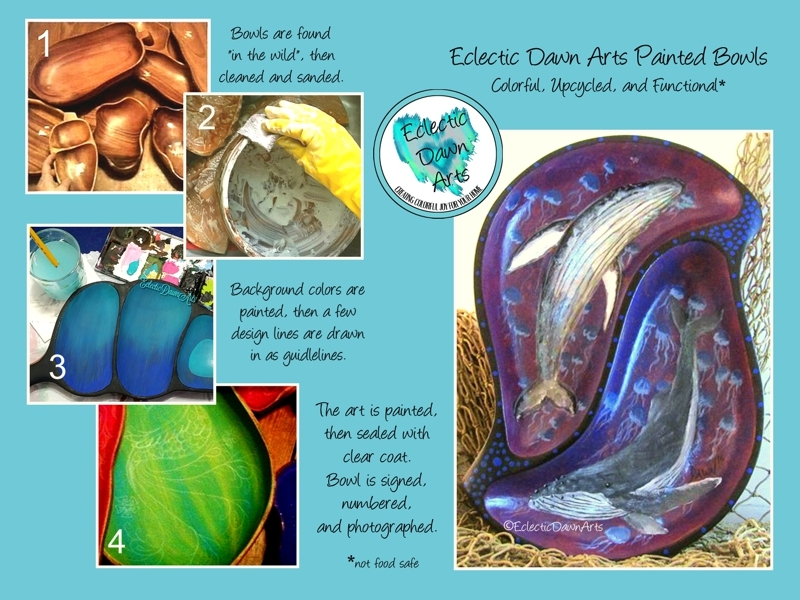 A wonderful gift for someone who loves tropical fish, aquariums, and, of course, the color purple! Free shipping. Not food safe, clean with damp cloth, do not put in dishwasher. 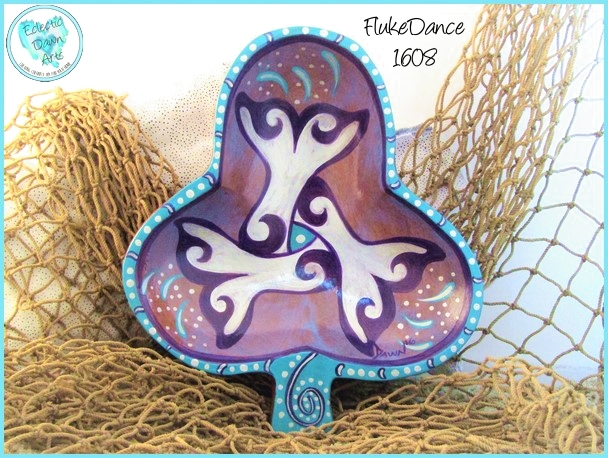 "Fluke Dance" (accessories not included) - TB1608 - ~7" x 6 1/4" (sizes are approximate) - If you are an ocean lover, or know someone who loves whales, this unique piece of tail art brings a bit of the sea to your hands! A triskelon is traditionally spirals with human legs, but we've re-imagined the symbol here with whale tails and spirals. Slightly tribal Celtic, but all ocean, with three flukes in a delightful splashing dance of purple, aqua, and metallic silver. 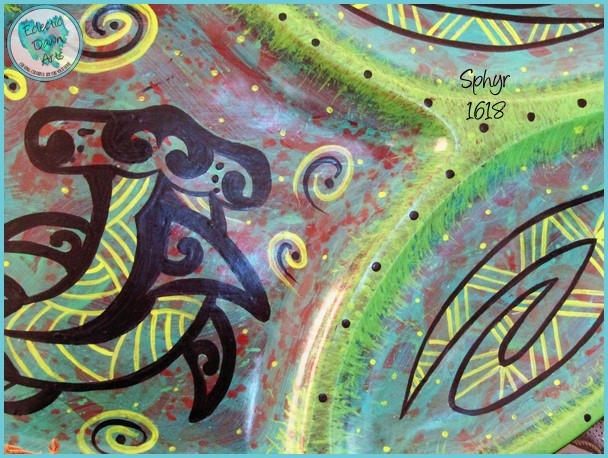 The fluke, or whale tail, is just a portion of the whale mystique...whales can symbolize strength, freedom, and speed. Some cultural mythology (Russian, Slavic, Arabian and Chinese) reveres whales as sacred. Bring some whale magic to your home! Free shipping. NOT FOOD SAFE, clean with damp cloth, do not put in dishwasher.